Are y'all on Facebook? Do you ever check out your memories? There are a couple of different apps that collect and display everything you've posted on Facebook on today's date in the past. As you know, yesterday was leap day, February 29, and the last time there was a February 29 was in 2012. I published a blog post that day, and it showed up in my Facebook memories yesterday. In 2012, AKD was in 6th grade, MC was in 3rd, Bubby was in his first year of preschool, and Camp Scarlet was in full swing. On February 29, 2012, we made muffins and I told y'all about how I had completed my three item to-do list before noon, along with a bunch of other stuff. So much has changed in those four years, and being reminded of that post yesterday made me think about where we'll be in another four years. In four years, on the next leap day, AKD will likely be in college, MC will be in 11th grade, and Bubby will be in his first year of Middle School, and who knows what else will have changed, or what will be the same? What did your life look like four years ago? What will it look like four years from now? Happy leap day, y'all. I kinda feel like I oughta have a leapy kind of theme this week, or at least today. I don't. I can't even think of anything leapy to put on the menu besides frog legs and bunny, neither of which I am willing to eat, let alone cook. Do you think less of me now? Can we still be friends? And here's what's on the menu this week. Inspired by the success of my white chocolate macadamia nut "Clif" bars, I decided to try another of AKD's favorites, chocolate peanut butter. In preparation, I tasted an actual Crunchy Peanut Butter Clif bar, and it was not good. My best description would be that it tasted...institutional. It certainly did not taste like peanut butter. I'm really not sure why my boy likes these things so much, other than that they're portable and filling. Anyway, I can definitely understand why AKD likes this version better. It's so delicious. In a large bowl, mix together crisp rice cereal, quick oats, flax seed, peanut butter chips, and 1/2 c. chocolate chips. Set aside. In a small saucepan over medium heat, mix together honey, peanut butter, and 1/4 c. chocolate chips, just until melted and combined. Stir in vanilla extract. In a small microwave safe bowl or cup, melt 1/4 c. chocolate chips or peanut butter chips according to package instructions. Add butter and stir until smooth. Drizzle melted mixture over the top of the bars in the pan and refrigerate until firm. * I pour the peanut butter mixture over the cereal mixture while it's still warm, which melts the white chocolate chips a bit. If you want bigger chunks of white chocolate in your finished bars, wait until the peanut butter mixture cools to room temperature. ** I just spray my hands with cooking spray and use them to press the mixture into the pan. Sometimes as Mamas, we just need hope. We do our best every day, but we wonder if our best is good enough. We feel like we've fallen woefully short. On those days, or in those seasons, we need someone to turn our hearts to God and remind us that God has not forgotten about us. In Hope Unfolding: Grace-Filled Truth for the Momma's Heart, author Becky Thompson of Scissortail Silk sets out to do just that. The author uses a conversational style and personal anecdotes to point her readers to God and inspire hope in ten bite-sized chapters. I enjoyed this book. Sometimes all we Mamas need to is to know that we're not alone, and this book accomplishes just that. We are not the only ones struggling with comparison, depression, or isolation, and God knows us and sees us and walks beside us. AKD is a teenage boy. As you may or may not be aware, teenage boys are always hungry. At least this one is. So AKD takes snacks to school to tide him over between meals. He likes Clif Bars, which we've been buying at Sam's Club. But it's the same old story. Store bought is expensive; I'd rather make my own. AKD's favorite is white chocolate macadamia nut, and I've developed a recipe that doesn't quite taste like Clif bars--I think my homemade bars taste better; AKD doesn't think one is better than the other. But they're delicious, and they're definitely cheaper. In a large bowl, mix together crisp rice cereal, quick oats, flax seed, nuts, and 1/2 c. white chocolate chips. Set aside. In a small saucepan over medium heat, mix together honey, peanut butter, and 1/4 c. white chocolate chips, just until melted and combined. Stir in vanilla extract. In a small microwave safe bowl or cup, melt remaining 1/4 c. white chocolate chips according to package instructions. Add coconut oil and stir until smooth. Drizzle white chocolate mixture over the top of the bars in the pan and refrigerate until firm. Did y'all know I have a recipe for Buckeyes on my blog? Yes! It's true! My sis called the other day to ask me a question about it, and I was like, really? I have a Buckeyes recipe on my blog? Sure enough, I do. I've been blogging since 2008, and apparently, the grasshoppers and turkeys made me do it. I had no idea. I thought my blog was an attempt at keeping far-flung family up to date about what's going on over here. But no. Grasshoppers and turkeys. This post is my 1262nd published post. So I guess it's OK that I've forgotten about one or two along the way. Wow. Just think about all the things you wouldn't know if I hadn't started blogging. Wanna know what surprised me last week? It surprised me that the family liked chicken fajita pasta. I mean, they like the flavors, but I was expecting them to not like the combination, because, well, they're weird like that. Although, I suppose it's not that weird. For instance, I like peanut butter, and I like coconut, but I do not like the combination of peanut butter and coconut. Anyway, they liked it, even the ones who went into the meal fully expecting not to. MC even had seconds, my friends, which is some kind of miracle. If my recipe success makes you want to try it, you should know that I thought it was pretty mild, but AKD thought the chicken fajita pasta was spicy. If your family is not a fan of spicy, you could always just use regular tomatoes instead of ro-tel, and use less (or less spicy) taco seasoning. Did I ever tell you about the time my sister in law and my favorite brother in law and their kids drove 500 miles to see us and we abandoned them in the company of our kids for several days? The other day Chip was taking photos off her phone and sent me these couple of pictures taken while they were here. And we were not. Poor Chip. She was probably overwhelmed with trying to keep an eye on 5 boys at once, especially since 60% of those boys tend to want to hang out in caves and behind waterfalls and climb up rock faces. The other 40% are heavily influenced by their cousins' daring feats. Which, in some ways, is a good thing. We did come home, Sawblock, and I. Eventually. 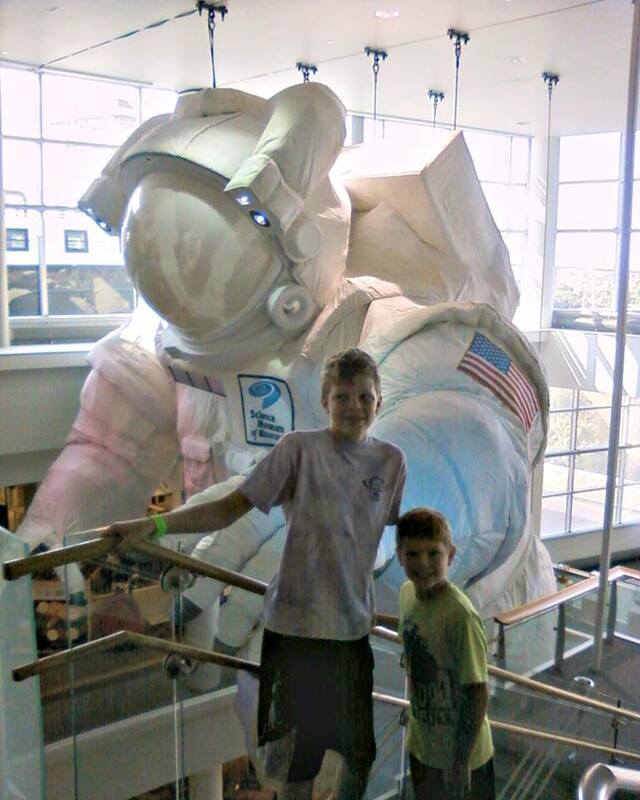 The boys and I started hanging out with astronauts. Really. Big. Astronauts. Then there was the time Sawblock and AKD kayaked, mountain biked, and trail ran, all in the same day, with about 500 of their closest ... competitors? And AKD came home with hardware. 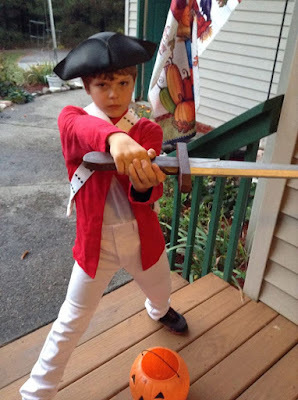 And then there was the time a Red Coat showed up on our doorstep, wielding his sword. Shortly thereafter, there was the time when MC got ... a little ... muddy. I'm not quite sure what's going on there or what to say about this. I mean, they're eating pie, obviously, but ... yeah. We ache deep within to meaningfully honor Christ’s resurrection. Yet, in practice, this focal point in the liturgical calendar is often a celebration of public holiday more than it is of humanity’s hope. At day’s end, we fall asleep well-fed and perhaps even grateful, yet still somehow something short of awed. Enduring awe is rarely the fruit of a morning’s celebration. Enduring awe is the fruit of daily participation with Jesus, our resurrected Love. 40 Days of Decrease invites readers to walk with Jesus through the holy decrease of less and loss that led Him cross-ward and beyond. Each day offers a meaningful consideration of Jesus’ journey through reading and reflection and then issues a challenging daily fast. Instead of social media, chocolate, and designer coffee, 40 Days of Decrease calls communities to a Lenten fasting of apathy, injustice, resentment, hypocrisy, and more for the love of God. After all, in the same way self cannot satisfy self no matter how long it feasts, self cannot starve self no matter how long it fasts. Decrease is only holy when its destination is love. We thin our lives to thicken our communion with God. Care to join me in a different kind of fast this Lenten season? God’s love, plans, and promises for you are forever unfolding. I get it, Momma. I totally get it. Every day you wake up and try your very best. You love, give, and pour out your life for the ones who call you Momma. But no matter how much you offer, there are still days you feel as though you come up short. You worry, Am I loving these babies enough? Is this ever going to get easier? Why does it seem like I am the only one who cannot balance it all? Sometimes, we just need hope (and maybe a long uninterrupted nap). We need someone to help tune our hearts to the voice of the Father and to remind us that He has not forgotten about us.In Hope Unfolding, Becky Thompson is a friend who reminds you that you aren’t alone, and that God is still writing your story. She guides you to encounter the Truth of God’s presence that not only fuels you with strength, but also a fresh confidence. And beyond gaining faith that tomorrow could be different, you find hope and purpose where you are standing today. I've shied away from Sarah Young's devotionals in the past because I think it's a little weird/presumptuous that she writes from the perspective of Jesus, as if Jesus were speaking (we can read the Bible if we want to know what Jesus has to say), but I have some good friends who highly recommend Sarah's stuff, we've reached the end of our current family devotional book, and it's free, so I thought I should try it. I'm pretty excited about this crop of books :) Feel free to read along! Did you catch what I said in my menu post yesterday? The part about making an emergency run to the library? Yeah. I'm willing to make a special trip for books, but not for food. In my world, running out of Boxcar Children books, which absolutely drive me bonkers when I have to read them out loud, is considered an emergency, while not having the ingredients to make a certain planned meal is not. What does that tell you about my priorities? This surprises me, because I certainly talk about food more often than I talk about books. The reason I'm not willing to make a special trip for food is because we do have food in the house. Plenty of food. Food that would last us at least a month if we needed it to. Well, maybe not quite that long... When we lived in West Virginia, I was a 45 minute drive away from the closest grocery store. I shopped once every 2 weeks and that was it. Hubby brought home the occasional gallon of milk, but for the most part, if we didn't have it, we didn't eat it. We also have plenty of books. Sure, we've read them all before, but we could definitely wait until the next scheduled library trip to get more books. We don't even necessarily need to go to the library anymore, since we've discovered e-books. Yes, I know. We didn't discover them. I guess I should say, since we've started using e-books. Have I told you that Bubby talks about the Alden children as if they're friends of his? More than once he's said, "that sounds like something Henry would say," or "I think Benny would like this." He's on book number 23 of approximately 237 gazillion. I guess it's a good thing that we will not run out of Boxcar Children books before Bubby outgrows the series. Makes it easier to find books for him, for sure. Anyway, I just thought that was kind of funny, the whole library emergency, and I was wondering if anyone else caught it and thought it was funny too. Or maybe you didn't think anything of it, because you feel the same way? Today we're supposed to have ancho chicken & black bean salad with cilantro lime dressing for supper. It is really yummy. And quite filling, but we haven't had it in a while. I'm not sure why. Anyway, it would have been helpful for me to have looked ahead to this week last week when I went grocery shopping, or even on Friday when I had to make an emergency run to the library (Bubby was out of Boxcar Children books), because I used the last of the chicken on Wednesday, I used the last of the Greek yogurt on Friday, I used the last of the romaine lettuce on Saturday, and I don't have a red pepper, a lime, or cilantro. In fact, pretty much the only thing for this recipe that we do have is black beans. And I'm not going grocery shopping until tomorrow. So, whatever, this whole post is a lie. We are not having ancho chicken & black bean salad with cilantro lime dressing for supper tonight. But that doesn't mean you can't. Go for it, friends. It's so good.